Arthur Charles Russell was born in 1891 in Kentish Town, London2, the youngest son of Edwin Hooper Russell and his wife Lucy (née Taylor). Edwin spent all his working life with the Midland Railway starting, age 15, as an assistant porter 3 and rising to hold various positions as Station Master. In 1911, he, his wife and the three younger of their five children, including Arthur Charles, were living at the Station House, Hellifield, Leeds, where he held the position of Station Master. Arthur Charles, then aged 19. was working as a ticket collector4. Although no record has been found as to the specific date, it is likely that he enlisted early in the war with the 10th Battalion, West Yorkshire Regiment (Prince of Wales Own), probably soon after it was formed at York in September 1914. After initial training in England as part of the 50th Brigade of 17th Division, the Battalion was assigned first to Home Defence duties before this decision was reversed and it was mobilised for war, landing in Boulogne on 14 July 1915 and taking part in an unsuccessful attack at Loos on the 29th September 1915. The Battalion then took up positions in the Ypres Salient where it was to see action over the next five months5. At 4.30am on 2nd March 1916, the Battalion made a further attack on The Bluff, re-taking trenches that had previously been lost and capturing enemy trenches. During that day, the Battalion faced heavy artillery retaliation by the enemy, with 120 casualties. Lance Corporal Russell was one of those killed in this action.6. Lance Corporal Russell was buried in Spoilbank Cemetery alongside three of his colleagues who were killed in the same action. 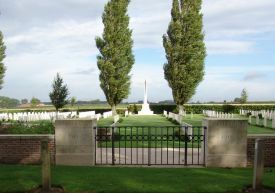 Spoilbank Cemetery (also known as Chester Farm Lower Cemetery or Gordon Terrace Cemetery) was begun in February 1915, and used by troops holding this sector of the Ypres Salient until March 1918 which includes The Bluff. It was enlarged after the Armistice when graves were brought in from the battlefields of Ypres and now contains 520 burials and commemorations of the First World War. 125 of the burials are unidentified and special memorials are erected to 11 casualties known or believed to be buried among them7. He was posthumously awarded the 1914-15 Star, British War and Victory medals8. Arthur Charles Russell's connection with Beeston is unclear. As we have seen, he was living with his parents in Leeds in 1911, is described as 'a native of Hellifield, Yorks' in his Commonwealth War Grave Commission record and joined a Yorkshire Regiment. His parents are recorded as living at Station House, 56 Lordsmill Street, Chesterfield, Derbyshire in his CWGC record. Although no evidence has been found, it is possible that he or his father worked at some point at Beeston Station which was, of course, on the Midland line. 2His birth was registered in St Pancras Registration District in Q3 1891 (Ref 1b 157). 41911 Census for Hellifield, Leeds - Piece 25740 RD484 SD3 ED3 Schedule 39. 5Based on information found at www.wartimememoriesproject.com/greatwar/allied/battalion.php?pid=1018. 6Description of the actions are based on the account in the Battalion War Diaries.